If you’re one of the 44 million people in the country with student debt, we know it isn’t easy keeping up with your payments, nor all the news coming out of the government related to changing student loan policies. 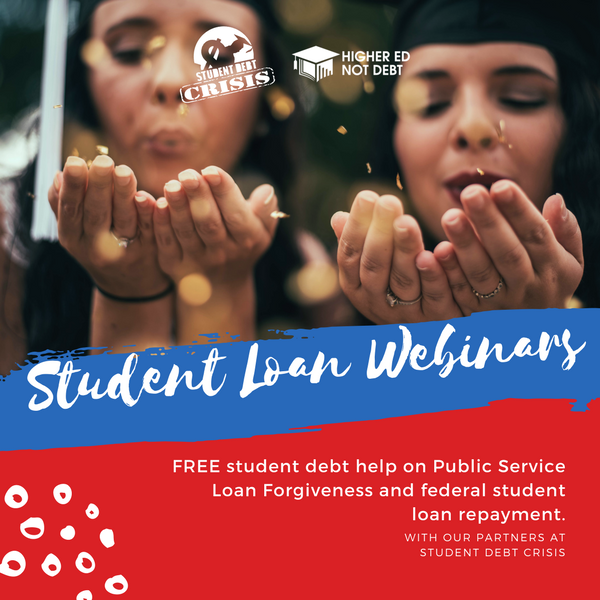 That’s why we at Higher Ed, Not Debt have teamed-up with Student Debt Crisis for a series of FREE webinars on April 25 to help borrowers with federal student loans. Wednesday, April 25th is “1-TDay” – the 6th anniversary of the day national student loan debt reached $1 trillion. On this day, we want to get you updated on current and changing policies affecting your student loans, ways you can help tackle the student debt crisis, and about your options for repaying your loans. Space is limited, so be sure you RSVP and join 5 minutes early to secure your space!